Many of the tall buildings that characterize the urban fabric of Valletta have been left vacant and derelict for decades. The small dimensions of these habitations have made them for a long time undesirable. Add to that the sheer physical effort to reach the top floors, albeit via elegant central masonry staircases winding their way up towards the light and views, and you have an equation that condemned these premises to abandon. In the light of this, the creation of an interesting upward-bound route was the key to the success of this project for the connection of two small properties and their rehabilitation and extension at roof level. This exquisite route starts at the front door which is reached at the top of a traditional winding masonry stairwell. 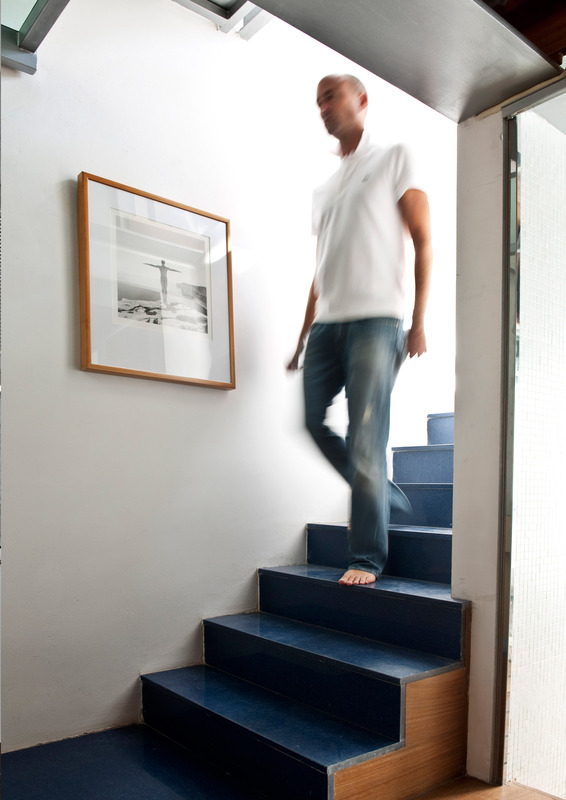 The particular typology of the main stairwell began to be used mostly during the English period and in fact is described, in Maltese construction vocabulary as ‘la Ingliza’. At this entrance level, the quiet zone of the property, the master bedroom and bathroom are discretely tucked away while the internal stairwell introduces itself here and propels the visitor up towards the light and the views. 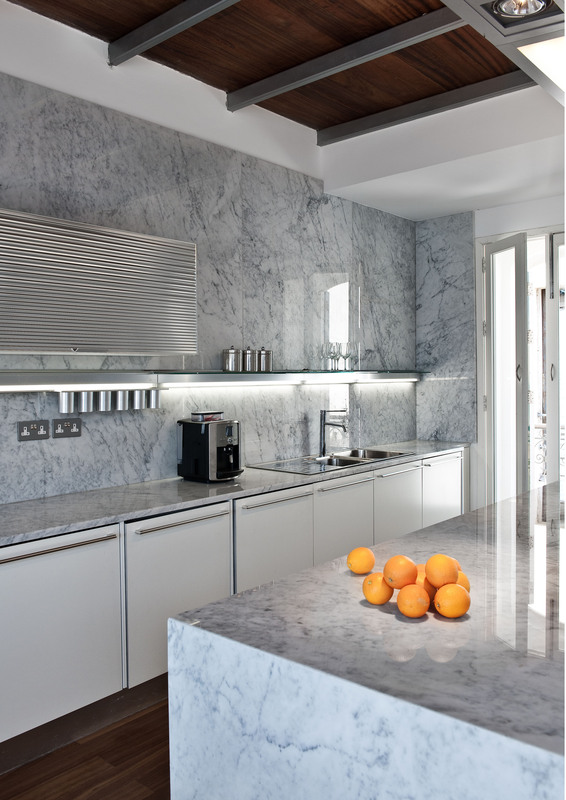 The first stop on the climb up is the marble clad kitchen that aligns itself with a first glimpse of the Grand Harbour, as it appears above the rooftops of the buildings of St. Anthony Street. A lightweight steel and glass staircase then leads one up to a lounge that hovers over the entire panoramic sweep of Grand Harbour. 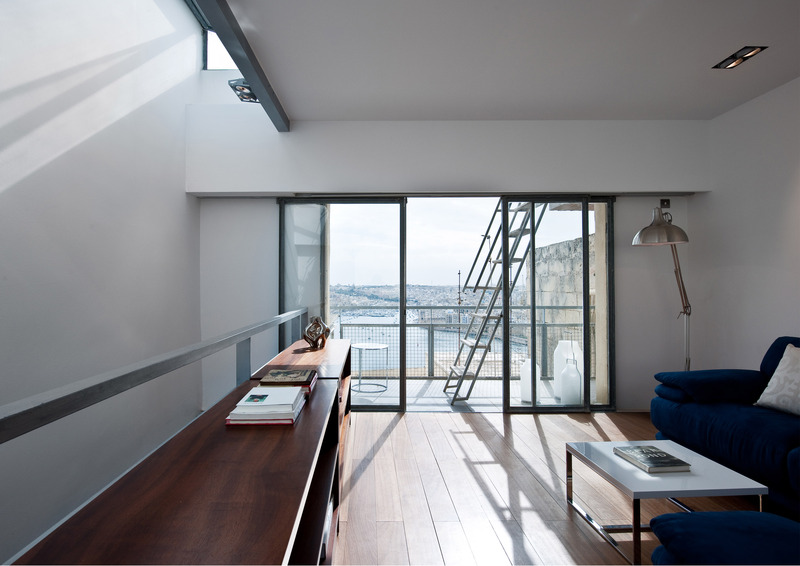 Finally, if vertigo has not kicked in yet, a drop down steel ladder, that serves as a shade when in its horizontal position, leads to the panoramic roof terrace, perhaps one of the highest points of Valletta.